Eye-bleeding cover of a ZONE children's book (Shogakukan, 1973). During the height of the Henshin Boom of the early 1970s, every network wanted their own superhero television series, and a number of studios were busy offering them proposals. 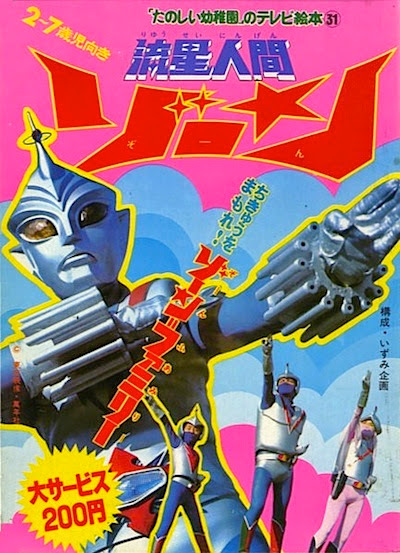 One of the more conservative was Toho Co., Ltd., who had produced the popular RAINBOWMAN, THE WARRIOR OF PIETY the previous year, they also planned to capitalize on the phenomenon with the conception of GODZILLA VS. MEGALON (1973), which opened in cinemas on March 17th — featuring the very superheroic sidekick, Jet Jaguar. Hot on it's heels, Toho and Mannensha Co. Ltd. unleashed ZONE, THE SHOOTING STAR MAN (shortened to ZONE FIGHTER for overseas sales) for the NTV (Nippon Television) network, with feature film monsters Godzilla, King Ghidorah, and Gigan appearing as guest stars (the Big G appears in five episodes). For 26 colorful and exciting episodes, Zone Fighter and his siblings sally forth against the vile alien forces of Garoga to protect their adopted home from destruction and bring peace to all mankind — with the help of Godzilla, of course! Ive had my fingers crossed for an official U.S. release of this for soooo long. Hellbilly raises a good point, and it would appear that with the release of Ultraseven (one word or two?) by Shout! Factory, they've at least a foot in the door in releasing the undubbed and largely unseen-by-Americans tokusatsu shows. I figure if anyone is qualified to estimate those odds, it'd be August. But I'm sure both sales and customer requests must be a big factor. Guest appearances by Godzilla and King Ghidorah should be a key drawing point. Zone Fighter/Meteor Man Zone and Space Giants (the American dub) are the top 2 tokus on my "Shout! Factory Wish List", followed by Kamen Rider Black and Kamen Rider Black RX. I like Ryusei Ningen Zone, but it´s a shame the series does not have a final episode. A question: Zone Angel was the first henshin heroine from tokusatsu?